Perfectly Created Chaos! : Last Color Inspiration. Here is my card for this week's Color Inspiration from Kristina Werner. It is also my last color inspiration for the summer. Next week I will be packing up my stamp and scrap supplies. I have some cards that I will be pre posting next week to share with you; but this is my last week of doing challenges. So, onto the card for today. This week's colors were Pacific Point, Yellow, Real Red, Black and White. I decided to use my Sushi Bowl set from Stampendous. I stamped the bowl in black ink and then did the all the inside fish, crab etc. Then I took my aquapainter and pacific point ink to fill it in. It made it a bit splotchy; but I decided that I liked that because to me, it makes it look more watery. I applied crystal effects to the fish, balloons and shells. The rest is self explanatory. Have a great day and thanks for visiting with me! I love it.. so cute and bright! Perfect! 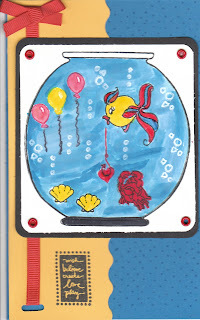 Love your little fish bowl--so cute! I just love this fish bowl, and your coloring is fab. I love that fish bowl. Nice card. My grandson is loving fishing, tadpoles right now, he would love this card.